From pictures alone, it can be hard to tell Gtech’s SW22 power sweeper apart from their AirRam vacuum cleaner. The heads of the devices have very similar forms, but there are some very fundamental difference between what the machines do. For starters, the SW22 isn’t actually a vacuum, instead it simply has a revolving brush bar (which have become a main feature of recent generations of vacuum cleaners) that picks out fragments of dirt and flicks them into a trough at the rear of the device. This time of cleaner is ideal for routine cleaning and for picking larger objects and crumbs as opposed to fine dust, such as dried leaves, pet hair and crumbs from carpets. Without vacuum suction, Gtech’s power sweepers are remarkably quiet and low energy devices, and as a result have remarkably long running times between recharges. 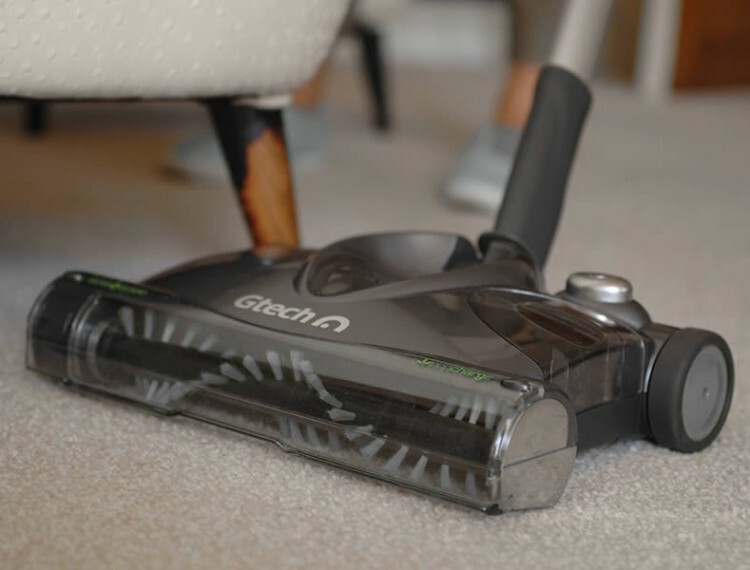 The telescopic handle of the Gtech SW22 is detachable and the sweeper becomes a handheld device for close-quarters cleaning such as staircases and sofas. The most immediate thing you’ll notice when using a Gtech SW22 Power Sweeper is how light it is. 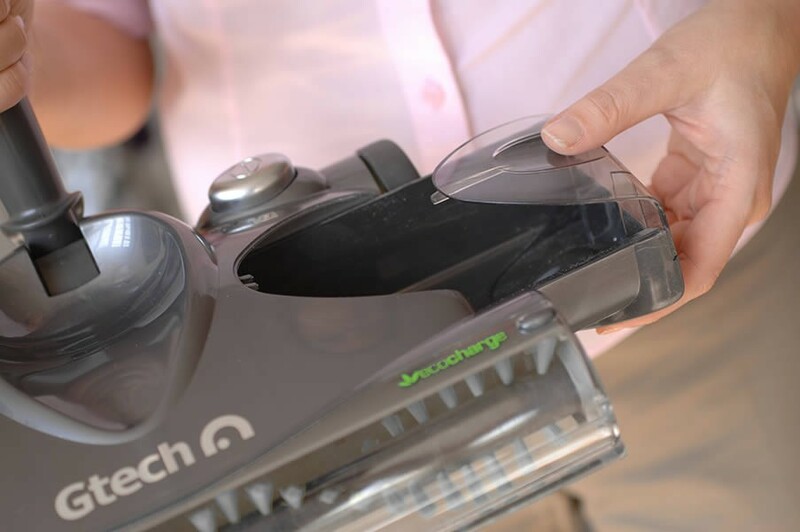 Weighing in at just 1.4kg, it is well under half the weight of Gtech’s already light AirRam vacuum cleaner, and this is because a power sweeper doesn’t have the bulk of an entire vacuum motor to carry. However the SW22 is even lighter than the previous SW20 and SW02 models as their NiMH batteries have been replaced by lighter and more effective Lithium Ion based batteries. Because of this, the SW22 is currently Gtech’s most premium power sweeper and costs £20 more than the former models. 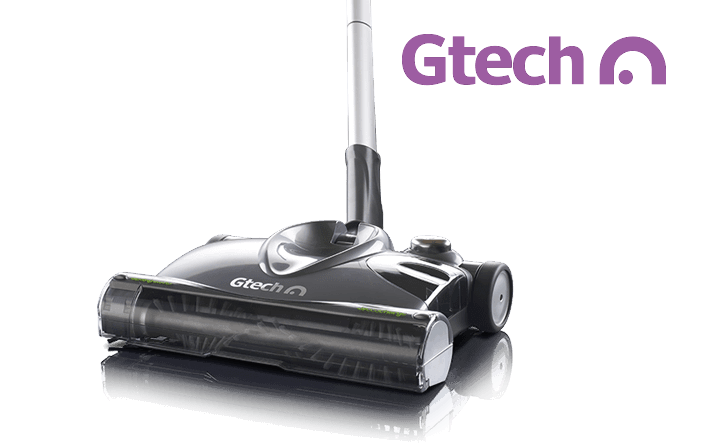 But at just £99, the Gtech SW22 sweeper is much more affordable than a comparable vacuum cleaner. Where the SW22 falls short is in overall cleaning power when compared to a full vacuum cleaner. However this is like comparing apples to oranges and Gtech’s SW22 outperforms other ‘power sweeper’ devices with ease. Not only is a Gtech SW22 cheap to buy, they’re also cheap to run with a very high degree of energy efficiency. The device can be recharged for just 1p (based on a £0.14 kWh tariff) and has a considerable running time of 120 minutes. Read Gtech SW22 reviews below to learn about the real experiences of customers. Gtech SW22 Power Sweeper has an average rating of 4.3 out of 5, based on 8 customer reviews. Oh my god I love my power sweeper! Its so light and quick to get out and is a great little cleaner. Have this by the back door constantly for getting rid of the dried mud etc the dogs and kids leave on the kitchen tile floor, for this its perfect however I’m not very impresed by its abilities with actual fine dust. I know its not actually a vacuum but I was expecting it to be able to perform a bit better in this respect. However it’s very easy to get out and carry up and down stairs so is a worthy addition to my arsenel! Had the older one with the NiMH batteries but they wore down after a few years and wouldn’t hold enough charge. Its quite frustrating but is a big limitation with all battery powered devices. However I was keen to try the lithium battery version as I’ve recently upgraded most of my power tools to lithium ion versions and the difference in charging times and weight was astounding. It’s the same case with Gtech’s vacuum sweepers and supposedly the new generation of lithium ion batteries have longer life spans as well. Thumbs up. A very efficient little cleaner that charges in no time and lasts a lot longer than our Dyson. However it doesn’t really compare to a proper vacuum cleaner when it comes to dust and is only really useful for larger crumbs etc. While I’m happy with it, for £100 one could purchase a very heavy duty vacuum cleaner such as a Henry. However I understand this isn’t for everyone as those are quite heavy for elderly people to lift up stairs etc and the lightweight of Gtechs power sweepers is very noticeable. I decided to get one of Gtech vacuum sweepers instead of going for a wireless full vacuum cleaner like dyson’s (pricey) or Gtechs. I’ve also kept my old wired henry cleaner and they make a great team. The SW22 certainly doesn’t have the same kind of sucking power as a henry but it’s very quick to use and the brush sweepers really help picking up larger bits. Designed for ease of use, Gtech power sweepers have a number of innovations including a powered edge-sweeping brush. They convert to perfectly balanced handheld carpet sweepers for cleaning stairs or upholstery too. Plus, because your Gtech sweeper is completely portable, you can use it as a cordless car cleaner.